Black and white photograph of James Clifford Gartshore. James Clifford Gartshore was born at Owen Sound on 26 August 1901. He moved to Oshawa and later to Whitby about 1939. In 1944, he was appointed Oshawa and Whitby Branch Manager for the Empire Life Insurance Company. In 1946, Gartshore opened a menswear store on Brock Street North and in 1951 he purchased Roy Fowler's Menswear on Brock Street South. 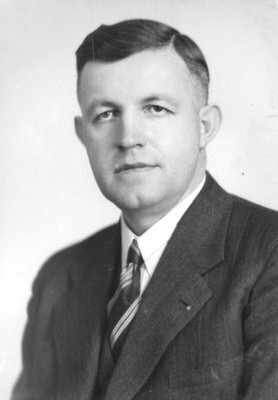 Gartshore was the founder of the Kinsmen Club of Whitby in 1942 and he served as club president for that year. He was also a coordinator for the National Kinsmen Clubs of Canada. Gartshore's son, James Gartshore was president of the Kinsmen Club from 1962-63, and his grandson, Donald, was president in 1990-1991. Gartshore was also director of the Whitby Chamber of Commerce and a member of the executive of the Whitby Branch of the Canadian Institute for the Blind. He died at Whitby on 11 November 1961 and is buried in Union Cemetery, Oshawa. James Clifford Gartshore, c.1942, unknown photographer, Whitby Archives, 31-009-554.